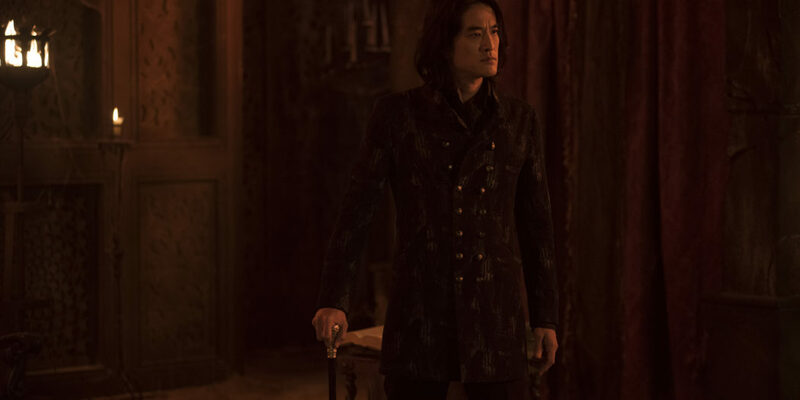 In the winter finale of Shadowhunters season three, we at last met the father of warlock Magnus Bane, the greater demon Asmodeus played by actor Jack Yang. While this Prince of Hell has been mentioned throughout the series before, this is the first time that we’ve seen him in the flesh and oh what sinful fun it was. 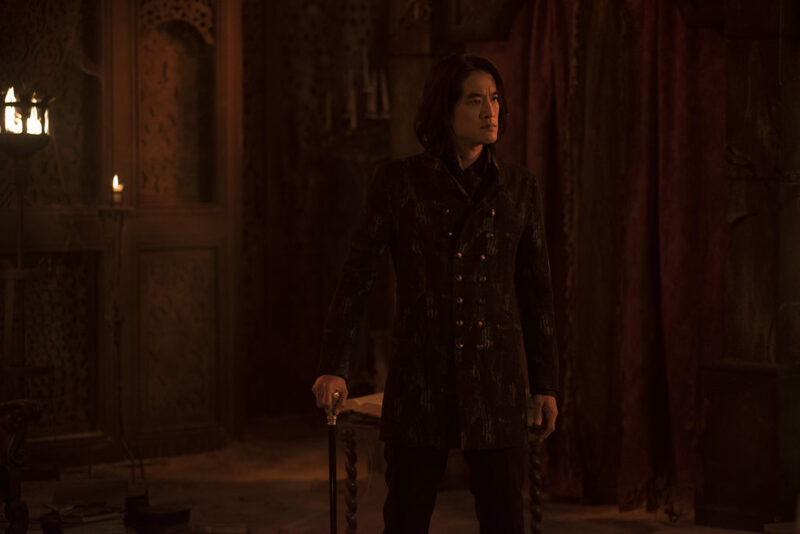 On the show, Magnus (Harry Shum Jr.) is forced to go to Edom and seek his father out after Lorenzo (Javier Munoz) forbade any of their kind from helping him save Jace (Dominic Sherwood) from Lilith’s (Anna Hopkins) control. Having no other recourse, he sets up a pentagram that will transport him to his (and Lilith’s) demonic realm. Admittedly this scene was so satisfying to watch because as a book reader we don’t visit Edom until City of Heavenly Fire. It is a barren desert wasteland with winged demons flying high above the orange sky. Magnus makes for a small crumbling structure that turns out to be his father’s home. As the two males reunite, Asmodeus’s eyes turn cat-like and it is identical to his son’s. The two also seem to share similar tastes in fashion. The greater demon walks with a limp and uses a cane which surprised me because what being could have inflicted that kind of permanent damage on a Prince of Hell? I hope we find out in 3B! 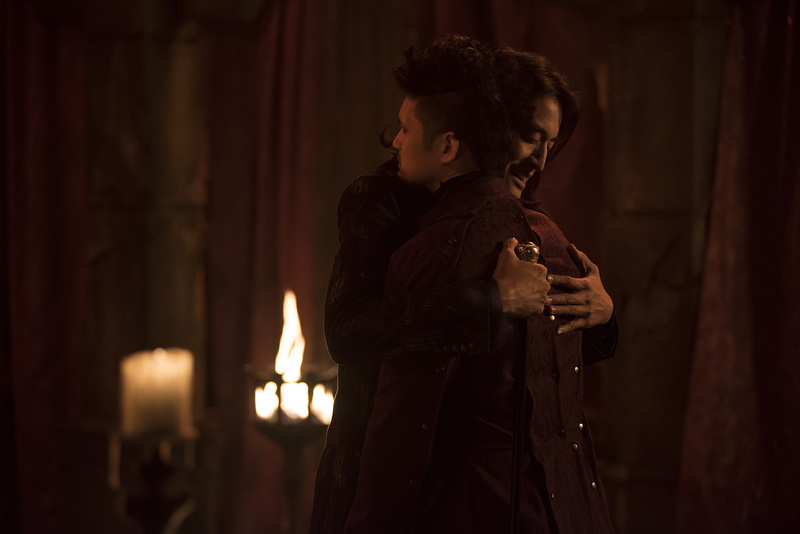 Asmodeus calls Magnus his beautiful boy and assumes that the warlock is here because his favorite child finally felt remorseful for banishing dear old dad. We find out that for awhile, father and son spent a number of years together until Magnus realized what the older male truly was. Asmodeus though seems genuinely hurt at the words hurled at him. First Lilith and now him, demons do seem capable of loving their children in their own way. The warlock then says that he didn’t come to apologize but to ask for assistance. Of course that pisses Asmodeus off. While Magnus tries to appeal to his father’s love over his pride, we find out that there’s a reason why calling on a greater demon is a dangerous and costly. Back on Earth, the two parabatai are fighting in an alley when Magnus arrives and is able to use the power he had gotten from the greater demon in order to destroy Lilith’s hold on Jace. However, the price for that power was to give up his magic. Dad truly demanded a very steep price in exchange for his help. Book readers will know that Asmodeus asked for a similar bargain in City of Heavenly Fire. 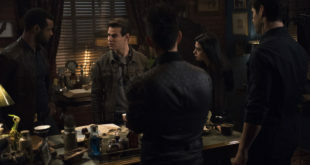 After Sebastian kidnapped the Downworld representatives (Magnus, Raphael, Luke and Jocelyn), Clary, Jace, Alec, Isabelle and Simon made their way to Edom to rescue them. As soon as the warlock entered his father’s realm he was weakened immensely all because Asmodeus wanted to be called upon. Eventually after Sebastian dies and the pathways between that world and the mortal one closed, Magnus was forced to call his father for help. As a show of his power he even whisks Jocelyn, Luke, and Jonathan’s body back to Idris for free. To send the rest of them back however, Magnus knows that his father wants his immortality in exchange. 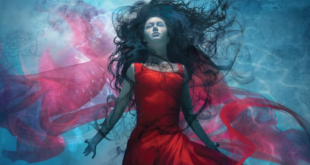 Unexpectedly Simon offers his own immortality instead as a dayligher vampire. He argues that since he was still young he would survive, though Izzy desperately points out that he’d already died. The greater demon scoffs and says he can easily make Mr. Lewis mortal again. Intrigued by the offer, he adds that aside from Simon’s immortality he will also take away all his memories of the Shadow World (as well as the Shadow World memories of his other friends and family a part from those currently present) so that he will return to his ordinary mundane life. This was to enact a more exquisite torture upon Clary and the squad, to have one of their own ripped away. Simon agrees to this and while everyone else is sent back to Alicante, he returned to New York. Eventually though, Magnus discovers a loophole in their bargain that if Simon remembered anything at all from the Shadow World, he would try to give the former vampire some of his memories back. He could eventually then try ascending to become a Shadowhunter himself. Asmodeus would not be able to harm him after that. So now the question is whether or not Asmodeus took Magnus’s immortality along with his magic on the show. The warlock is hundreds of years old and his body wouldn’t survive without some degree of magic and so I’m a little worried. On the plus side though, Shadowhunters showrunner Darren Swimmer confirmed to TV Line that we’ll be seeing more of Asmodeus in 3B. We’ll also learn more about Magnus’s backstory and I can’t wait to see more of this complicated father-son relationship. There isn’t an official date yet as to when the second half of season 3 will air, but it’s expected to be sometime this coming fall. Till then we’ll just have to rewatch the midseason finale a few dozen times to tide us over.